Lately, we’ve been trying out a lot of hand-pulled noodles in town. 2 of the most visited restaurants offering it are Shanghai Hand-Pulled Noodles in Retiro, Quezon City and Beijing Hand-Pulled Noodles in Little Baguio, San Juan. It’s a small restaurant in Retiro. With its unpretentious guise, you wouldn’t even mind trying it but be surprised with how much they put pride into their hand-pulled noodles, especially their dry noodles. Dry noodles in reality is not dry but characterized by a small amount of soup compared to an ordinary noodle. The beef is tender and the soup is really tasty, though a little bit salty for my taste. Nevertheless, I'll never hesitate to order this one next time. The wrapper is a little bit thick or perhaps the filling is not enough to savor the dumpling but nevertheless, the lamb is still good. The restaurant is offering a generous serving for their cheap price, P90 for regular orders and P120 for large. A regular order is enough to satisfy your hunger. Shanghai Hand Pulled Noodles is at 411 Amoranto Street (for. Retiro), Barangay Maharlika, Quezon City. This restaurant is located in Little Baguio and is bigger and has a wider range of menu than Shanghai Hand-Pulled Noodles. Noodles at Beijing only come in one size. When our orders were served, the first thing we noticed is that Beijing’s has bigger portions of toppings in them. Lamb Soup Noodles. My sister complained that the lamb lacks in its usual taste and that the broth is a bit sour. The Pork Pata Noodles is new on the menu. My brother loved this one. Noodles range from P130 to P175 except for Vegetarian Noodles at P95. 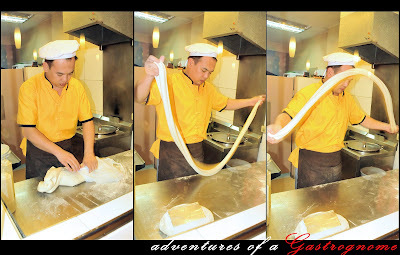 Check out Beijing Hand-Pulled Noodles at 8001 Jose Abad Santos Street, Little Baguio, San Juan. Both restaurants have their own Pros. For Shanghai, you can choose from regular or large order which is convenient especially to people who are not used to eating heavy meals. Second, we liked Shanghai’s broth because of its full meaty flavor. Third, the meat toppings are more succulent. Last, cheaper than Beijing’s. For Beijing, the atmosphere is better. Second, they offer a wider range in menu than Shanghai’s. Last, the bigger portions of toppings on every noodle dish. Both restaurants have good quality noodles. And I can’t say which is best for it’s only been a short while since we had this Hand-Pulled Noodle hunt. However from the 2 restaurants, I’ll go for Shanghai Hand-Pulled Noodles. P.S. I still have to try Lan Zhou La Mien in Binondo, which a lot of people say is the best in town. Cookiespink. I will try that as soon as I can. Meylin's location is at MOA, right? Thanks for the comment.